In Atlantic City Blackjack, the dealer always stands on 17. The dealer checks his hole card for a blackjack on a 10 or ace. The cost of a surrender is half of your original bet, and you cannot surrender if the dealer is showing an ace. Chips come in 8 denominations, from 1 credit to 500 credits. Max first bet for any hand is 500 USD/Euro/GBP. Blackjack pays out at 3:2 on your original bet. If you have a winning hand, but not blackjack, you are paid out at 1:1 on your original bet. If the dealer gets blackjack and you took insurance on his ace, your insurance bet (half of your original bet) pays out at 2:1. Atlantic City Blackjack has bright, bold graphics. Realistic chip trays and other item surround a plush, green table. The view is top-down, so you are looking straight at the action from above. All gameplay happens using buttons on the bottom, except for betting, which involves dragging chips from your tray onto the table. The buttons are clearly labeled, but there are a lot of then, so it takes some time to get used to. The game offers auto play, which uses the built-in strategy table to decide what to do on any possible hand. This table can be edited as you like, so the computer always does what you want it to do. 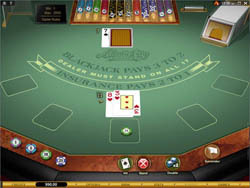 Atlantic City Blackjack Gold is basically a graphically-enhanced version of the non-Gold version. This version has very realistic graphics. The view is isometric, so you are looking down and across at the table, which is more realistic than the top-down view. All gameplay happens using tiny rollover buttons on the bottom, except for betting, which involves dragging chips from your animated chip tray onto the table. Basically,the Gold version offers great graphics, animation, and even nice background music, but because the screen is full of your view of the table, all the buttons and things you need to click are small and sometimes hard to see. It is a trade off, and since the rules are the same, you can choose which one you want to play. Because Atlantic City Blackjack is a hole card game, a slightly different strategy will apply than if you were playing two-up blackjack. Since one of the dealer’s cards is hidden from view until your hands are compared, there is an element of surprise involved. Generally, it is best to assume that the hole card is worth 10. This will keep your bets a bit more conservative, and will better prepare you if the dealer has a good hand. Overall, this is a good, solid blackjack game. The rules are quite standard as for as AC games go, but player who are used to Vegas style blackjack will find them restrictive, especially the rules about split aces. Great graphics and gameplay help enhance this excellent Microgaming blackjack variation.